I reread this less-known novel by T H White for the #1947Club because I had a Folio Club edition that I’d never read. 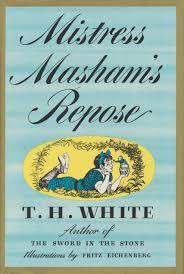 My paperback copy of Mistress Masham’s Repose fell apart through overuse many year ago, so I was very happy to find this large, illustrated, embossed edition in a fancy cardboard slipcase, lurking under a shelf in a second-hand bookshop. But the problem with a slipcase is that it anonymises the book inside, and so for years my eye would glide over its dull whiteness without remembering the glory of the novel inside. 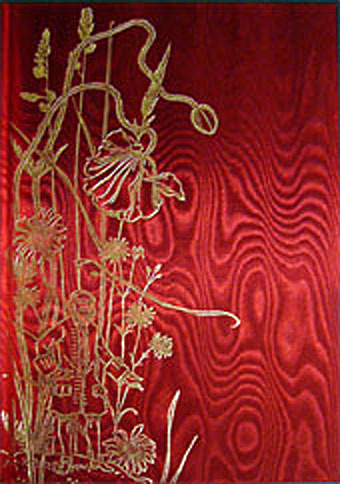 It did protect the fine red watered silk binding, so I’m pleased about that. This is a glorious novel, and will remind you of Joan Aiken’s Dido Twite novels (which I must also reread), since they too are set in an alternate history and landscape and feature a horrible governess villain who torments the imprisoned child hero in a vast country estate (published 1962 onwards). 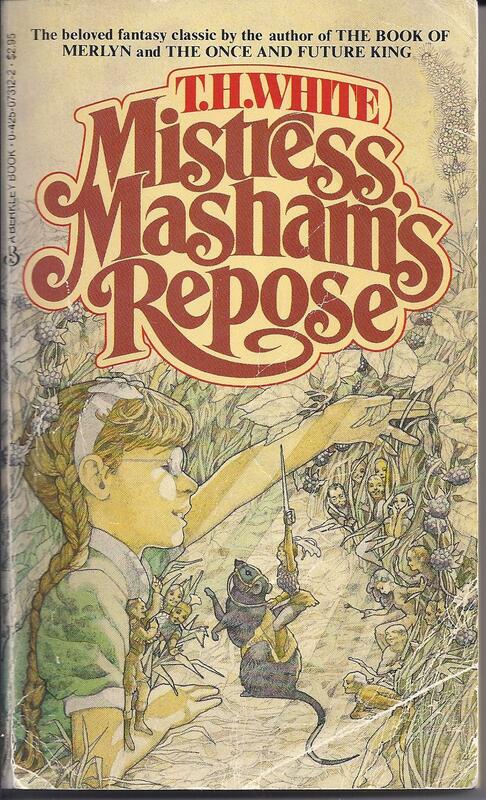 It helps if you’ve already read Swift’s Gulliver’s Travels, since Mistress Masham’s Repose is a fanciful continuation of the plight of the Lilliputians, but this is not a requirement, since everything is explained. When Gulliver left Lilliput and its six-inch-tall people he boasted foolishly about them to the sailors on his ship. Once he had been landed safely, the ship tore back to Lilliput, looking for manikins to exhibit at fairs to make the sailors’ fortunes. One group of kidnapped Lilliputians escaped while on tour in Northamptonshire, and found their way to an island on an ornamental lake, which contains a folly of a temple called Mistress Masham’s Repose. 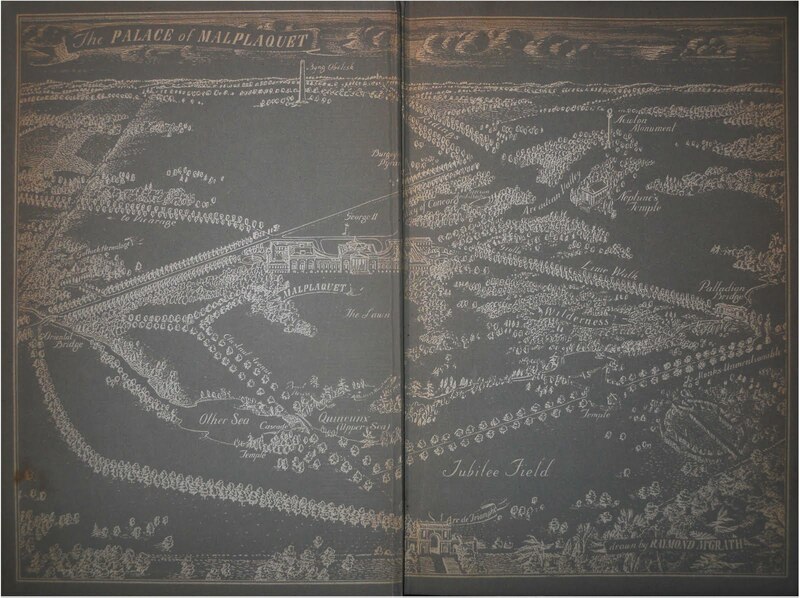 The lake is in the large ducal estate of Malplaquet, which is something like Blenheim Palace and Stowe and Stourhead combined. Without anyone knowing, the Lilliputians settled, married, had descendants, and became Lilliput in Exile, farming, hunting and managing as best they could on their untropical island. Enter Maria. She is the ten-year old orphaned daughter of the Malplaquet family, kept in poverty by her horrible governess Miss Brown and the vile Vicar, Mr Hater, who are siphoning off her inheritance and working out how to remove it from her completely, with accidental murder a possible option. The Malplaquet estate is truly vast, but practically derelict. The house has 365 windows, all broken but six, fifty-two state bedrooms, and twelve company rooms … It had been built by one of her ducal ancestors who had been a friend of the poet Pope’s, and it was surrounded by Vistas, Obelisks, Pyramids, Columns, Temples, Rotundas, and Palladian Bridges. White gleefully renames the dusty, neglected rooms to puncture the ducal pomposity, and exaggerates the ruinous extent of the palace, for it really is a ducal palace, not just a stately home, to reinforce Maria’s parlous plight of poverty, semi-starvation, and ignorance, for she is barely taught anything. Maria runs away from Miss Brown one day, decides to visit the lake called the Quincunx, and visit the artificial island and its temple. For the first time Maria penetrates the thicket of brambles that surrounds the Repose. To her amazement the grass is short and cropped, and there is a miniature baby sleeping in a cradle made of a walnut shell. She seizes the cradle in amazement, looks down to notice that she is being stabbed in the foot by a tiny, furious woman armed with a harpoon, and seizes her too. She goes home, puts her new toys safely in a tight drawer, and goes down to the kitchen to have her supper. Cook is one of Maria’s only two friends in the world. The other is the Professor, who lives on the estate on almost nothing apart from Cook’s discreet food parcels, and Maria takes her toys to show him the next day. The Professor explains that these are people, and that Maria must take them back: ‘people must not tyrannise’. This she does, and communications begin between Maria and Lilliputians. They can speak an eighteenth-century form of English, and the Professor, to his delight, finds a basic dictionary of Lilliputian in the Malplaquet library (probably left by Swift on a visit to the first Duke). The Lilliputians and Maria exchange gifts, and they tolerate her rather rampageous ways, realising that she is a very young Giant. They become her allies in her long and bitter battle against Miss Brown and Mr Hater. These villains spot and capture the Lilliputians, and imprison Maria in the dungeons, and then in the Vicarage. Cook rides her bicycle frantically to the Lord-Lieutenant’s house to raise the alarm before murder is done. This splendid story was written while White was beginning the research for his The Age of Scandal (1950) and The Scandalmongers (1952), which are anthologised studies of the later eighteenth century in England and its rackety, murderous, scatological, oversexed ways. 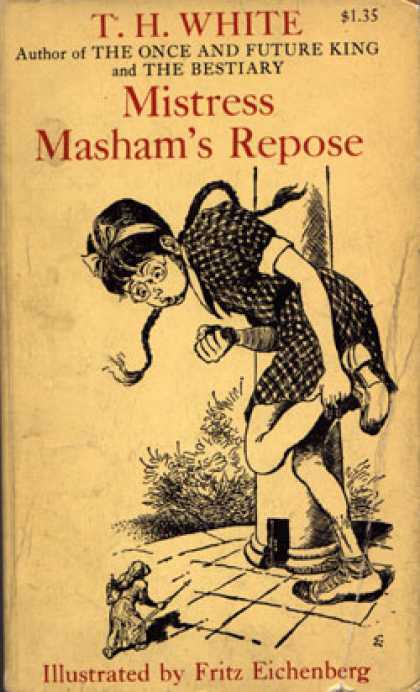 Mistress Masham’s Repose is nothing like those two works, but it shares a passion for the period (even though it is set in the 1930s or thereabouts). It is a searching and eccentric investigation into what life could be like for Lilliputians in the wild, and how a young girl with good intentions but not much knowledge might be able to help them. The Professor is a repeat performance of White’s most famous scholarly creation, Merlyn from The Sword in the Stone (1938), in modern tweeds. The Lord-Lieutenant is King Arthur’s foster-father Sir Ector all over again, and Maria could be a female version of the Wart, but with less humility. Maria’s poverty and isolation, and her matter-of-fact, make-do-and-mend ways remind us that this is also a post-war novel, written for a population still living under rationing. White is not sentimental about this child’s sufferings, and expects her to get on and make the best of the grim situation in which he has written her. The Lilliputians are refugees, still hoping to return to the Lilliput that none of them can remember, and Maria is a survivor among the ruins created by enemy action and neglect. The villains embody the tyrannical rules and regulations that White would resist all his life. It is not a charming novel, but it is brave, honest, delightful and inspiring. I don’t think I’d ever heard of this book before but it sounds very interesting. Will have to keep an eye out for it! What an excellent review. I will put this on my TBR tower of lucsiousness. Thank you for the introduction. Thank you! I hope you find it and enjoy it. This is actually the ONLY T.H. White book I’ve read – and that without having read Gulliver’s Travels – and I really enjoyed it. Far more than I expected, actually. I hadn’t realised it was 1947 until you mentioned it the other day – so pleased to have it as part of the 1947 Club!